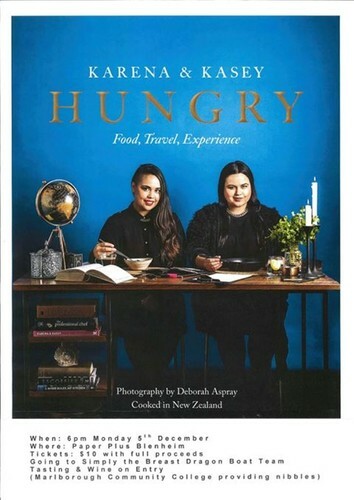 Following their recent TV series Karena And Kasey's 'Kitchen Diplomacy' you are invited to come along and see the girls at Paper Plus Blenheim on Monday 5 December. The self-taught Kiwi cooking duo will be talking about their hectic tour of the globe whilst filming their cooking show. Visiting Korea, Italy, Vietnam, India, USA, Japan, Chile, New Caledonia, China and Indonesia they amassed a wealth of knowledge and experience and will be very entertaining I’m sure. Tickets include a drink on arrival with a ‘tasting’ prepared by Marlborough Community college; followed by the presentation and book signing. There will be a raffle on the night too so bring some money! All proceeds going to Simply the Breast Dragon Boat team so please come along, get a group together and support this local breast cancer survivor team. Tickets available from Paper Plus Blenheim or ring Wendie on 021 183 6802. See you there!